PANTHERNATION: @d3football No, based on statistics. 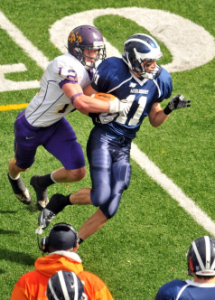 See http://sites.middlebury.edu/panthernation/2012/11/13/a-quick-note-on-zach-driscoll/ … (not updated). Think he deserved it more than Moores or Chapman. D3FOOTBALL.COM: As you can tell, this is not purely a stat leaders award. RT@MiddPantherBlog: @d3football No, based on statistics. PANTHERNATION: @d3football Neither of your FIRST team WRs had more receptions/game, yards/game/ OR TDs/game than Zach Driscoll. PANTHERNATION: @d3football So here’s the question: Is there anything he could have done to make the team? If so, what? To which @d3football did not reply. It is unfortunate that the selection was made the way it was, and unfortunate that they were unable, and then unwilling, to defend it. I underlined all of the statistics where the player in question surpassed Zach Driscoll’s number. Get it? Not a single All-American selection put up better numbers than Zach Driscoll, in ANY of the three categories. He had more receptions per game than each of them, more receiving yards per game than each of them, and more receiving TDs per game than each of them (!). So this is not just a case of us saying, “Our guy was good enough to be an All-American,” which plenty of fans of schools across the country are saying, and which is a reflection of the admittedly difficult task of selecting among a crop of many great and deserving players. Rather, this is a case of saying: how can you possibly defend your eight selections against one player who had more receptions, receiving yards, and touchdowns per game than any of them? You put together the best statistics among all of the All-American wide-receivers and produce a super-All-American hybrid and he still will average fewer receptions, yards, and TDs per game than Zach Driscoll. It would not have been possible for Zach Driscoll to put together a more impressive 2012 season in any respect other than degree-to-which-he-surpassed-the-other-eight, which is simply a preposterous contingency for his selection. And to anyone who argues that Driscoll is a “System Wide Receiver,” which has somehow become part of the typical narrative on Driscoll, that is simply not the case. There has never been a wide receiver nearly as dominant as Driscoll in Middlebury’s history, let alone in Coach Bob Ritter’s tenure running this offensive system. The reason that Zach Driscoll flourished was because of his phenomenal route-running ability, glue hands, and plus athleticism. He was an impossible matchup because he was a threat to make a play everywhere on the field. His route tree was complex, and he made opposing defenses mad with his versatility as a receiver. Press him and he beats you deep down the sideline for six; back off and he’ll catch one across the middle then rack up yards after the catch; play him straight and he will run one of his signature post or flag intermediate routes that always end up with him streaking into a pocket in the secondary with his defender in recovery mode and the end zone in his sights; etcetera. He made catches in traffic, in space, in the end zone, while getting hit, while bodying defenders, and while running by defenders. And he did it over, and over, and over again. That isn’t a system player or a fluky stats player; it’s a no-brainer All-American. This was written by Jeffrey Hetzel. Posted on Wednesday, December 19, 2012, at 12:56 am. Filed under Football. Bookmark the permalink. Follow comments here with the RSS feed. Post a comment or leave a trackback. Hey Damon/Jeff — that’s pretty unprofessional. I might have been willing to respond more but not after getting called out for not responding at 12:30 a.m. ET. You can’t say *anyone* is a no-brainer for All-American status, not when there are eight receivers on the team and about 500 starting receivers in Division III. Re: “getting called out”- I wrote 799 words here, 2 of which (“then unwilling”) might have been unfair (although it’s hard to say how else I should have characterized it). I am sorry for not trying to describe the end of the conversation more fairly (ie by speculating about the many possible explanations for a non-response). Please do not let those 2 words get in the way of the conversation we should be having about football, which is what I was writing about for 99.74% of my post. Let’s talk about Driscoll, how an All-American Team gets picked, what he would have to have done to make it, etc. Driscoll did put up big numbers. This is true. You played ONE quality opponent (Trinity)in which he was held to 52 yards. Imagine if he were a receiver in a good conference. He wouldn’t have put up close to those numbers. I’m not taking away from the amazing season he had but he just flat out didn’t play anybody. I’m sorry that he didn’t make all-american but to call out the other players to say that they deserved it less than him is just low. Adrian Peterson would run for 250 yards per game if he played the chiefs and jaguars week in and week out. It’s a legitimate case you are making, but its not an outrage. Sorry. First of all, thanks for making an actual argument, that’s what we were hoping for. That said, it’s very hard to say what a quality opponent is with 200+ schools playing an average of ten teams a season with limited traveling. E.g. Did Castleton State’s Brandon Boyle deserve the AA when they played a “weak” schedule (7 teams they beat combined .375 record) and he was held to TWO yards in their tournament game? Not going to do research on every player’s every opponent in order to prove the point, but if leading the nation in every category was easy in the NESCAC it would happen more than never. Anyway the NESCAC has 3 AA players all of whom played the same schedule so clearly the guys making the team don’t buy your argument. The question I posed earlier stands to you and your conjectural “he wouldn’t have put up close to those numbers” argument: what would he have had to do to make the team? If you truly believe one “subpar” game (52 yards and a TD in game his QB threw for 133 and a TD… gasp) is enough to disqualify him because of your opponent theory, then no NESCAC player should ever make the AA team. The point is Zach Driscoll put up the best wide receiver season in his conference’s history, and put up better numbers than every player who made the team (in all three categories), while playing against D3 opponents. I never said I could change the already-announced All-American teams with a post on a low-read sports blog. That’s an absurd portrayal of my position. I said he deserved to make the team. It didn’t cause me agony to say that, nor was it in vain merely because of the obvious fact that I can’t change history. If the argument “you dragging it out is not going to get him on the team and its just going to prolong the agony” was valid, then nobody in any discipline could ever question decisions made in the past by virtue of their being unchangeable. Yet that class of argument is a huge part of intelligent discourse in human society, one which is especially relevant in sports analysis (E.g. Should Bill Belichick have gone for it on 4th and 2?, Did Mike Trout deserve the MVP?, Was the Mario Williams contract a bad idea?, etc.) Get it? When you turn on sports radio do you just think: “don’t prolong the agony, you can’t change anything, therefore you’re still wrong in some sense”? Of course not. So, if you agree Driscoll should have made the team, the fact that “snubs happen” or that we can’t change it shouldn’t factor into the discussion. It should be the end of the story.